This scene is typical of the social occasions in which Greenham delighted; it is also characterized by his strong contours and areas of flat colour. 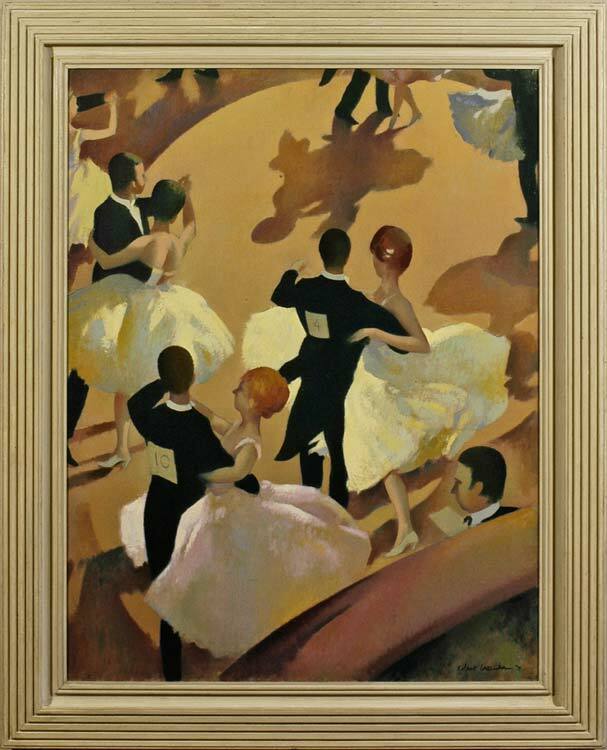 The vertiginous viewpoint allows the dancing couples to be depicted as a series of interlocking stylized forms, black against the opalescent pastel colours of the ballroom frocks, swirling up the canvas. The effect is of a complex formalized abstract pattern, set in the curving band between the foreground balcony sill and the outer edge of the spotlit dancefloor. As in many of his works, the influence of poster art from the 1930s-60s is apparent, as perhaps also the work of M.C. Escher. For further reading on this painting, please click here. Robert Duckworth Greenham (1906-76) was born in Streatham, the elder brother of Peter Greenham R.A. He trained at the Byam Shaw School of Art and then at the Royal Academy Schools (1926-29), where he was awarded a Landseer Scholarship, Creswick Prize, Silver Medal for painting, and the British Institute Scholarship. He was a very versatile artist: as well as paintings, he produced etchings, prints, wood engravings and murals. He was perhaps most popular during the period when he was painting coastal and beach scenes, set mainly in Suffolk; other subjects included fêtes, regattas and other, generally outdoor, social occasions. These landscapes and other scenes are characterized by strong outlines and areas of flat colour, rather poster-like in style, where the shapes of deckchairs and parasols take on an almost abstract life. In the 1930s and ’40s Greenham made a series of portraits of actresses and film stars, including Greta Garbo and Jessie Matthews, inspired by cinema stills. He exhibited regularly at the Royal Academy, New English Art Club and the London Group; at the Royal Society of British Artists and Royal Institute of Oil Painters (to both of which he was elected); the Royal Scottish Academy and the Royal Society of Portrait Painters, as well as many commercial galleries. Works in public collections include Martita Hunt (after 1943), London, National Portrait Gallery (from the series of portraits of stars, inspired in this case by a photograph for Vogue of Hunt by Cecil Beaton); Portrait of E. Byford, 1928, Braintree District Museum; St Peter Port…, 1974, Guernsey Museums & Galleries.